Whether it’s your dorm or your college apartment, celebrate this upcoming season by bringing some life into your home without actually buying anything new. 1. Recycled Mosaic Kitchen Art: Advertising fans, graphic designers and package design snobs will all appreciate this project. Taking a look around your kitchen cabinets, you probably see an abundance of color thanks to the labels on various food items. Sometimes I simply hate throwing out boxes or certain labels because they’re just so pretty and someone put hard work into designing them. So, once you’re finished with food labels or cereal boxes, take a second look and save them! Simply cut portions of the paper into squares (or any shape you’d like) to use for a bright and cheery mosaic that you can show off in any room. It’s a great way to add color and also put old packaging to good use. 2. DIY Cement Planters: Next time you’re done with a plastic bottle, think twice about throwing it out. Whether the plastic item is big or small, with just a few easy steps you can turn it into a cement planter to add some floral cheer to your kitchen or any other room. If adding flowers to it isn’t your thing, you can simply use for display on a table top or above a fireplace. Oh, and don’t be afraid of color! Use bright pops of red, gold or silver for some holiday cheer. 3. Cup Holder Wall Decor: Aren’t disposable cup-holders such a pain sometimes? Sure they help you not spill multiple scolding hot coffee cups all over yourself while you’re juggling a bunch of beverages, but they are pretty useless one you’re through with them. So, in the garbage they go, right? Not so fast. What may be seen as trash can easily be turned into treasure. Create a cool lighting installation in your own college apartment to add something extra to the atmosphere. 4. 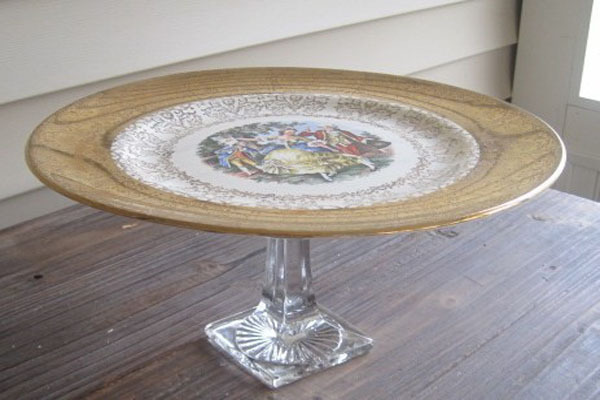 Vintage Cake Plates: Perhaps one of the easiest ways to use items that you either have already in your cupboard or can find at the thrift store are DIY cake plates. Simply take one of your favorite beautiful plates, of any size, and hot glue a candle stick to the bottom. The cake plate pictured above is one of the many I’ve created just to spruce things up a bit around the house. It’s so easy and versatile. If you want to get really fancy, make a tiered version to serve up your wonderful holiday delicacies to guests or to place gorgeous lit candles on top of. 5. DIY Wine Bottle Lights – When it comes to strung holiday lights, the decor opportunities are endless! Purchase a pack of white (or colorful) tiny lights and get going. This project in particular is extra fun because it involves wine. Crafting or working on small home projects just happens to be ten times better when you’ve got some wine flowing. Once you are finished with your bottle, follow these steps to create a festive form of lighting that is perfect for setting a cozy mood. Place on a buffet table if you’re throwing a holiday shindig or place in dimly lit corners to add a bit of sparkle to the room.